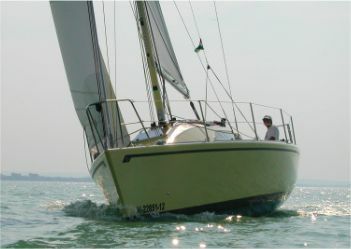 The Mount Gay 30 is of a size that could possibly accept similar construction to the 26 but it is a much more serious boat. It has to be capable of offshore passages in rough conditions so a requirement of the Rule is that it has to meet the scantling requirements of the American Bureau of Shipping Guide for Offshore Racing Yachts. These boats also tend to be raced hard, with heavily loaded rigs. For these reasons I have chosen to use a fully framed structure with I-beam backbone. The departure from the structure of the Didi 34/38 is that the I-beam ties into a grid of floors cut from plywood instead of being laminated from solid timber. The result is a stiff structure to reduce hull distortion under rig loadings.